The plot is both simple and complicated. At its core, it's the story of a young man (Ehrenreich) who doesn't quite blend in the Bible Belt town in which he resides. Ethan's mother recently died in a car accident and his father has been basically catatonic ever since. He is thoughtful bookworm in a town with more banned books that available ones, and it is that love of literature that allows him to initially bond with the new girl in town. Lena Duchannes (Englert) has just moved to town, but is already under suspicion by all around her because her uncle is rumored to be a devil worshiper. The two kids quickly hit it off, but Lena has bigger problems than the joys of first romance. Lena is indeed 'unique' as her family is basically a coven of witches (called 'casters') and on her sixteenth birthday she will either go to the light or go towards the darkness. Romantic melodrama, coming-of-age symbolism, and surprisingly winning comedy ensues. Teen melodrama eventually gives way to supernatural problem solving, to the film's detriment. Much of the final half of the film involves belabored attempts to guarantee that Lena won't "go dark" with a solution that renders the major characters almost completely passive for the majority of the climax. But getting there is a genuine treat. The film's central romance really works, with clever dialogue and an amusing give-and-take between both young leads. Enrenreich oozes southern charm while reminding us in looks and charisma of a young Leonardo DiCaprio (he has DiCaprio's over-enunciation thing down-pat). Englert, looking like a cross between Jennifer Lawrence and Rooney Mara, is a comparatively moodier and subtler character, but she too gets moments of wry amusement and sarcastic biting wit, especially in her earlier moments. Point being, the two young leads are terrific and are terrific together, which means you actually care about how the central romance is resolved even as the supernatural mythology takes over in the last act. If the kids keep things rooted in emotional authenticity, the adults generally devour the scenery and come back for seconds. Jeremy Irons, as the mysterious patriarch (and Lena's reviled uncle), is an absolute delight here. Irons' first scene is a camp delight, but he only goes arch when the story requires it. He gets a big scene with pretty much every major character and he brings out the best in everyone around him. Not that Emma Thompson or Viola Davis need the help per se, but he anchors the film in a manner similar to Willem Dafoe in the first Spider-Man, bringing his A-game and making sure everyone else does too. Thompson is also a camp hoot, playing the leader of the town's religious community who has some secrets of her own. Davis plays it comparatively straight but is fully aware of the inherent goofiness of someone like Viola Davis playing a mystical librarian in a movie like this. Emmy Rossum shows up at around the hour mark, literally tearing into town. Playing an exiled family member who 'went to the dark,' Rossum has great fun playing what amounts to a femme fatale. Kyle Gallner shows up in what amounts to a nearly silent cameo (at least he's not dour or depressed) for what I presume will be an expanded part in the second chapter of this story. While the film shines when the focus is on character, it all-but crashes when the focus turns towards resolving its central conflict. The film fails to truly lay out the specific of what 'going dark' or 'going light' really means and thus we don't know how much of this is predestination or merely a case of self-fulfilling prophecy. The film also doesn't quite deal with the inherent cruelty of casting out female family members (the whole light/dark thing doesn't apply to boys) who had the misfortune of going dark. The final resolution is frankly a dud, with a muted confrontation set during a Civil War reenactment that both keeps its young leads somewhat apart at key intervals and seemingly makes up new mystical rules right on the spot. A quick scan of the original novel's plot on Wikipedia shows that the film inexplicably left out some simple but important details as well as clarifying the seemingly obtuse epilogue. To the picture's credit, the filmmakers are careful not to equate blossoming into womanhood (i.e. -- liberated sexuality) with becoming 'dark.' But as we get further down the rabbit hole, we get further away from the character interaction that made the film crackle and the film becomes basically a waiting game as we wait to see if Lena 'goes dark' or whether there is some way to avoid that seemingly predetermined outcome. There are some interesting monologues here and there about the nature of human emotion and how religion operates in a world of obvious magic, but the film still feels like it's running in place for much of its third act. 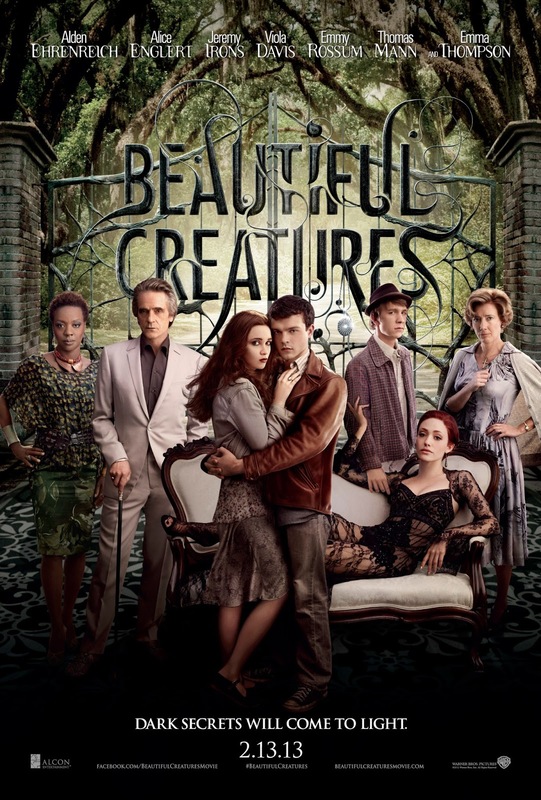 Even if it doesn't stick the landing, Beautiful Creatures is incredibly entertaining and engaging for most of its running time and it doesn't completely destroy its earned goodwill by the end. The film works as both a look at social and cultural isolation in small-town America, as well as a parable for the cultural traps laid out for young girls as they grow into women. It is sharply directed by Richard LaGravenese who uses as little green-screen or CGI as possible. It looks gorgeous throughout, shot in 2.35:1 35mm film by Philippe Rousselot and featuring haunting interior and exterior locales. The film's witty and literate screenplay, also by Richard LaGravenese (of course adapted from Kami Garcia and Margaret Stohl's novel) elevates the proceedings with a genuinely authentic conversational flair. Yes, the two young lovers talk about stuff other than their romance. The entire game cast treats this material as proverbial Shakespeare and the youngsters more than hold their own against the veterans. I wish the picture ended as well as it began, but the first and second acts are genuinely terrific and a credit to what may be a burgeoning sub-genre. If the next big blockbuster genre is indeed the young-adult teen literature adaptation, let them all be as technically polished, charmingly written, and splendidly acted as Beautiful Creatures.